I believe, at least for Nathan and Daniel, they calculated the values themselves so you can cite them. I think it’s fabulous sharing this information. Could you give the source. Obviously, this type of information on storage times/temperatures cannot be easily verified and is pretty safety-critical. I’d like to use the data, but clearly it would be difficult to justify without a reference. Thanks. Douglas has some references on the great SV page he has been building. pounce – thanks for posting the link. Happy I can track the storage temperatures back to a reviewed source. Douglas – Great work! Love the egg pictures – looks just like the ones that come out of my water bath. Do you have experimental data that confirms the heating/cooling tables you’ve put together? For example, I’ve found that in the case of a sausage vs the same thickness piece of meat, the sausage ‘cooks’ a good deal faster (measured with a probe thermometer), so geometry could be an additional factor. Any idea if there is a measurable difference between the use of a circulating and non-circulating bath? I’ve only got a non-circulating bath, and haven’t found an inexpensive way of pushing the water around at, say, 70C so I can test the difference. How significant the difference in water temps will be in the bath depends on where the heat source is located and the insulation characteristics. A number of us have found that an aquarium air pump (less than $10) will provide ample circulation for most baths. They can be used with or without air stones. sygyzy – you’re right, and I was expecting a difference. What I didn’t know until I tried it was how big a difference there is between items of different geometries. Initially I started with a simple theoretical model based on Peter Barham’s formula included in his book ‘The Science of Cooking’. Unfortunately, the experimental approach seems to be at variance with the theory. So, I pose the question – has the theory been subjected to any real-world testing? I’m feeling my way in this area and have the impression that we are not quite ready to recommend a 20 mins a lb approach. e_monster – thanks for the thought. I’ve been measuring the water temperature and find some minor variation depending on location within the bath. What surprised me was the additional variation caused when a pack is added – the temperature is consistently higher than the thermostat setting. So I figured that some circulation might help. After a long conversation (convoluted) with my local aquarium shop I came away with some doubts about using a circulating pump due to the high temperatures (and kit in the UK doesn’t seem to be as inexpensive as in the US). I guess that an aerator seems to work OK for you – how much stuff can you put in the bath before the circulation is slowed? If you want to try an aquarium approach you don't want a power head or a water pump. You want an air pump. It's just going to bubble air through a plastic hose in your SV. This works find for long times. Short times benefit from faster moving water. You aren't just keeping the water in the bath the same temp by mixing it you are effecting how fast the item in the bath heats the item by keeping the fluid that is in contact with the item at the right temp. Think about it. If you put a frozen steak in a still, but hot, pot the water will be hot most everywhere, but the water right next to the frozen steak will be cooled. If I was smarter I would quote all sorts of thermal and fluid dynamics stuff. I just know that the faster the water flows (within reason) and the more consistent you can keep the overall fluid temp the faster the item will arrive at temp. I have cooked up to an 11 pound brisket (which took up a significant percentage of the surface area) and the temperature distribution remained quite even when the air pump was in use. (Within 0.75F everywhere that I measured when the brisket was in the bath). With a less massive piece of meat, the temperature distribution is much more even than that in my cooker. With my setup, the heat changes slowly enough that the circulation provided by the air pump is enough to keep the heat evenly distributed. You can search this topic for posts by me to read more about the setups that I use. pounce – you are my link master! Now I have to figure out which pump. Any ideas which of the less expensive aerators sit outside the bath (not in it)? Just ask for an inexpesive air pump and don't bother with the air stone etc. just get enough clear plastic tubing to go from the pump to the bottom of your pot with the little more for trial and error etc. Probably about £10 in a London pet supermarket. which is one of the quieter small pumps. While I have collected some experimental data, I base my calculations on the results of various academic journals articles (from Journal of Food Engineering, Meat Science, Food Research International, Lebensmittel-Wissenschaft und Technologie,...). While the mathematics of computing heating/cooling times is straightforward (for a mathematician ), it requires numerous assumptions that cannot be true in all (or even any) cases. My first assumption is that there is no harm in cooking a piece of meat longer than it needs to come up to temperature, but not cooking a piece of meat long enough could be very dangerous. Thus, my goal is to compute cooking/cooling times that assure (with 98% confidence*) that any meat you cook/cool will reach the desired temperature within the computed time. Therefore, I am not at all surprised that your sausage cooked a good deal faster than my tables predicted. The problem, is that there is no way to determine a priori if the sausage will be done in the time listed or in half the time listed. Even for the same type and cut of meat, one piece could take more than 60% longer than another**. to come up to 64C in a 65C cooking medium (with a starting temperature of 4C). The problem, is that a crock-pot has little or no natural convection and the meat could take much longer than calculated. Moreover, the times assume that the average temperature of the cooking medium does not drop substantially when the meat is inserted. * I am (perhaps fallaciously) assuming that thermal diffusivity is normally distributed. ** For similar pieces of pork, the thermal diffusivity ranged for 1.12 to 1.83 mm^2/sec in [J Food Eng 77 (2006) 731--738]. Is there a consensus on the best time to place the meat inside the rice cooker/bath? Should you drop it in after it has come up to temperature or put it in with room temp water and let it sit through the heating process? to assure that it will reach at 127.5F (53C) in 6 hours. I am nursing an idea of making risotto with frog legs - does anybody have any experience/suggestions for frog leg SV? I am primarily interested in temp/time, but would like to hear seasoning ideas as well. Do we SV legs as we do chicken, because there is some similarity between the two, or do we treat them as fish/shellfish? Douglas, still trying to catch up. Does this mean that the rate limiting step to achieve any given internal temperature is not the interface between the water and food, but the rate of heat diffusion within the food? Yes, heat diffusion is the slow part. Roughly speaking you can expect diffusion to scale with time like the square of the thickness, so a steak that is twice as thick should take 4 times longer to cook. (2) Since I'm using the air pump, I can't close the lid of the cooker and am using aluminum foil over the top of the cooker for insulation/evaporation control. Is the pump necessary when using a closed rice cooker, or is there sufficient convection in the cooker? (3) My girlfriend thinks that I'm insane and is convinced that I am turning our kitchen into a chemistry lab. Could someone provide the archetypal "blow 'em away" SV recipe that will convince her that I am not a mad scientist, but actually a visionary whose only desire is to offer her other worldly sensual pleasures? (1) You are quite right, if you want a `steakier' short rib then you would use a lower temperature for a longer time (say 131F/55C for 24 hours) and if you want a `braised' short rib then you would use a higher temperature for a shorter time (say 176F/80C for 8-12 hours). (2) The air pump may not be necessary, but it certainly doesn't hurt anything. If you have a good (thermocouple) digital thermometer, you can measure the water temperature at multiple points and see if the water temperature is uniform without the air pump. (3) Everyone probably has their favorite `blow 'em away' sous-vide recipe. I usually show off the power of sous-vide by making roast beef: chuck roast seasoned with salt and pepper and cooked for 24 hours at 131F/55C. I use chuck roast because it has great flavor, is extremely tender after the collagen has dissolved into gelatin, and is inexpensive (only about $3/lb at Costco). Some of my friends absolutely love sous-vide salmon, while others don't care for it at all. Many of my friends like sous-vide chicken breasts, but I think that is just because conventionally prepared chicken is grossly overcooked. If you do go for chicken, I would recommend removing the skin first and preparing it separately and then brining the chicken breasts. try plain carrots just peel them, vac pack them and sous vide them. they will be the sweetest carrots she ever tasted. say no added sugar or anything else, if this method can do that for a plain carrot imagine what it could do for other dishes. Cut the carrot into 2 inch long and 1cm wide sticks. Depends how tender you want them but I believe the consensus was 83C for an hour. 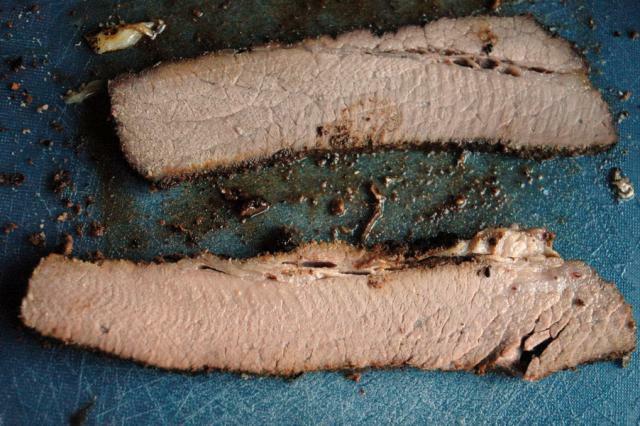 I wanted to see what would happen if I smoked a brisket and then cooked it sous-vide. I now have my SV Magic set up with a 30-cup rice cooker (which I got for free through freecycle.org). Since cooking SV is relatively new for me, I also decided to toss some other things in. - Two shallots, one in ooil, the other dry. Most veggies need a higher temperature to break down cellulose, but I thought that shallots might work. - The smoked/SV brisket had more flavor (both spice and smoke) permeating the meat all the way through, and was moist and tender. It also tasted meatier. The ends were moister and more broken down than the center of the cut, suggesting that longer might be better. - The caraway and garlic powder pork tenderloin was the most garlicky, but the caraway was mostly lost. I will play with the smoking/SV more. The results were good, but I expect to be able to get something better. Here is a link to other images. Congrats on your first SV experience! Also, you seem to "overcrowded" your SV vehicle - I don't know if there was any circulation in that rice cooker, but chances are different cuts were cooked at different temps - I would suggest to allow water to circulate, and to maintain temp within .25-.5C range. If you go beyond that - temp will get out of control, esp. in a limited space. You use a blowtorch to careamelize your meat - it's a lot of fun, and it looks/feels quite theatrical, but browning meat that way yields uneven results - that heavy cast iron pan and a touch of clarified butter would probably work much better. I looked at your pics - awesome!!! What internal temp were you trying to achieve for your cuts? Did you check the temps during cooking? Great post. I have been interested in a hybrid experiment like this but haven't had a chance with brisket yet. What temp and time did you use on the SV brisket? I suspect that one doesn't even need 2 hrs in the smoker to develop a fair amount of smoke flavor when it is going to be finished SV.